“The Trafalgar Messenger” HMS Pickle, and the making of a Cornish legend. The Trafalgar Collection. “The Trafalgar Messenger” a marine painting measures 48 x 61 cms (19″ x 24″), oils, ex frame ex studio, available, price upon application. HMS Pickle was in a hurry, when know from her log book, as she approached The Lizard point, most Southerly mainland of the British Isles, she has all possible sail set; she had Admiral Collingwood’s official Trafalgar dispatch aboard. The Trafalgar Dispatch is news that is going to stun the British nation. HMS Pickle crossed Mounts Bay approaching The Lizard Point under full light weather sail on the 4 th of November 1805.
please note, you will probably be seeing these ‘details’ larger than life size, enjoy. Pickle Night: The date is still celebrated in the Royal Navy and elsewhere. This painting includes details of Pickle never seen before and a persistent Cornish legend disputed by most scholars. The story is in our main ‘further reading’ text below. For a better appreciation deeper into this text. HMS Pickle “The Trafalgar Messenger” off Mounts Bay, Cornwall as she approached Falmouth sailing to take her place in history, November 4th 1805. There is a sense of excitement. We witness men calling boat to boat, one lugger is putting up her helm to speak having has sailed to intercept Pickle, another is over hastily, urgently raising sail. Following the popularity of “I have Urgent Dispatches” a number of people asked for a calm weather picture of Pickle. Given the endearing, enduring interest in Pickle it had to be done. 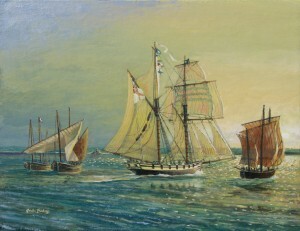 This painting is based on a number of factors: the known weather and track of HM Schooner Pickle, original and new information about her actual appearance and a Cornish legend. Pickle was the kind of ship which if seen today many might say, ‘what a beautiful big ship’ and yet in her day she was considered tiny, only worth a lieutenant to command her. 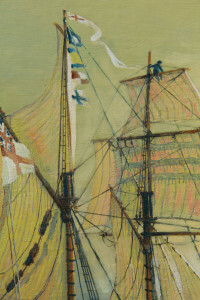 Gordon Frickers chose to paint Pickle for ‘Victory 2005’ while he was official artist for H.M.S. Victory. His brief was ‘The interesting but less well known Nelson and Victory stories’. He felt while it is hard for modern people to understand the ships of Nelson’s time. Gordon felt intuitively Pickle was the sort of size of vessel modern yachtsmen could relate to. One painting probably represents HMS Pickle more accurately than any painting other, Robert Dodd’s coloured aquatint engraving of The Battle of Trafalgar. Probably the first illustration made in London of the Battle of Trafalgar. This fine painting, the first known painting of the battle of Trafalgar shows details that suggest in was overseen by a naval expert, supervised by a reliable eye witness who knew HMS Pickle intimately, most likely Lt. Lapenotiere her commander. 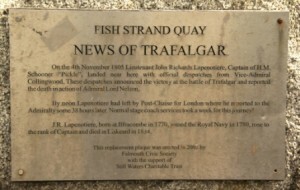 Robert Dodds had a studio close by the Admiralty buildings in London, many of his clients were naval officers some of whom were known to advise on details thus it is quite probable Lieutenant Lapenotiere was asked to help Dodds with his ‘battle of Trafalgar’. Thanks to a descendent of Lieutenant John Richards Lapenotiere Gordon Frickers has been able to closely examine this painting which includes our Pickle. HMS Pickle “The Trafalgar Messenger” is based in part on a careful detailed examination of the only 2 pictures likely to have been overseen by a reliable eye witness, her commander. These pictures were bought to the attention of Gordon Frickers by a descendant of Captain Lapenotiere who lived in Pylent, Cornwall. A suggestion of Anne Maddever a descendant of Lt. Lapenotiere was to show the Popham’s code “I have urgent dispatches” signal flying. Anne thought the Pickle men would have wanted it that way. Pickle’s hoist was 2144, signalling she had news She flew the new 1805 code devised by Admiral Popham, capable of conveying over 3000 words and phrases. 2214 read as “I have urgent dispatches” meaning she was under orders to suffer no delays. For good measure Gordon added a St Piran’s cross to on of the luggers just in case people don’t notice St Michael’s Mount and the Cornish coast in the background. When “I have urgent dispatches” was painted back in 1995 Gordon Frickers was official artist to HMS Victory so had a letter of introduction from the Victory’s Captain, magic for opening doors and dusty draws giving unique access to many sources previously unresearched. He visited archives and experts in Paris, Brest, Madrid, Cadiz, San Sebastian, Liverpool, London, Plymouth and in Portsmouth including interviewing the now legendary Peter Goodwin and Dr. Colin White. We agreed Pickle was slightly different from the naval schooner model at the RN Museum Portsmouth which is often wrongly attributed as being Pickle. We thought we had Pickle as accurate as was possible at that time. Now we know more. Spelling: I have used ‘despatch’ on the first 5 prints of “The Trafalgar Messenger” not ‘dispatch’… The Oxford dictionary gives ‘despatch’ as a variant spelling of dispatch. The broad band, ‘Nelson’s bright yellow’ colour is based upon a letter found by Peter Goodwin, Nelson to the Malta dockyard, paint order and confirmed by Gordon Frickers experiments (see Nelson’s Bright Yellow) and his visit to Her Majesties Hydrographic Office, Taunton, England. A series of Very accurate original large colour watercolours made as navigational aids which have never been displayed so are unaffected by fade or chemical change were painted by Serres while at sea with the Royal Navy as official marine artist to King George III. 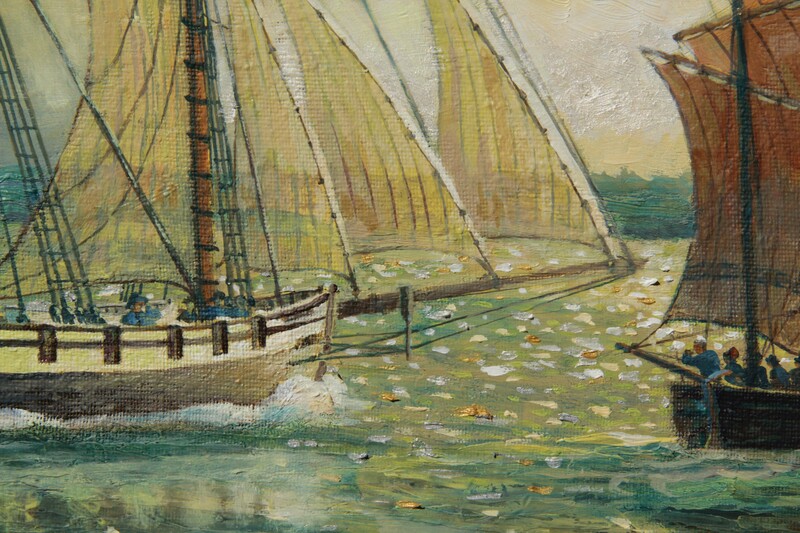 A thin tapered black ‘go fast’ line on Pickle’s yellow strake was discovered on Robert Dodds painting. Gun ports: the curved gunwale above each port was a discovery by Peter Goodwin who managed to track down the original documents relating to Pickles refits at Plymouth. 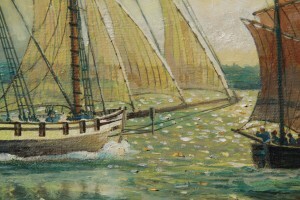 Rig height; Pickle looks over masted however the proportions are true to the Dodds painting so likely approved by Lt. Lapenotiere. Gordon Frickers has used the word ‘despatch’ on the first 5 prints of “The Trafalgar Messenger” not the more usual ‘dispatch’… The Oxford dictionary gives ‘despatch’ as a variant spelling of dispatch. Gordon Frickers chose Pickle partly because he felt while it is hard for modern people to understand the ships of Nelson’s time (HMS Victory at Portsmouth is the only ‘original’ ship of her type still with us). He felt Pickle was the sort of size of vessel modern yachtsmen could relate to. Pickle was the kind of ship which if seen today in port many would say, ‘what a beautiful big ship’ and yet in her day she was considered tiny, a lieutenant’s command. A wag at Trafalgar aboard HMS Britannia described Pickle as “about as dangerous as a pair of boots”. One of the painting’s central themes is communication; the contrast between then in 1805 with today, the legend is a part. Let us examine the story. Most scholars, as academics routinely do with ‘legends’, deny the Cornish claim to Penzance town hall being the first place to announce the Trafalgar news in Britain. There remains a persistent strong oral tradition in West Cornwall. Admiral Collingwood as soon as possible after the momentous battle of Trafalgar chose HMS Pickle commanded by Lt. Lapenotiere to carry with all haste his now famous official Trafalgar dispatch to London. Collingwood chose Pickle because she was available, fast, had often been a dispatch vessel and the Lapenotiere family recount he owed her commander Lieutenant John Richard Lapenotiere a favour. Local legend insists while approaching Cornwall thecrew of HM Schooner Pickle spoke with Cornish fishing luggers. The 4 th of November 1805 off the Cornish coast we know from the log of the Pickle (in the PRO at Kew) and other sources was a calm hazy Cornish November dawn. Pickle would have appeared to the fishermen who’s boats were speckled over Mounts Bay as emerging from the still dark South West horizon as she ghosted under a full press of sail across Mounts Bay. There would be a hint to the North of St Michael’s Mount in the distance and ahead, The Lizard Point. It was wartime; the fishermen would have been keeping a sharp look out for French or Spanish raiders so relieved to recognise Pickle. Those hardy men would have known Pickle from her many patrols and via local news. They’d have known she was with Nelson and often a dispatch vessel, some may have been relatives of her crew, thus cousin Jack would speak with cousin Jack. but we got Nelson…) the fishermen immediately made sail for their home port, the tiny Cornish village of Mousehole (pronounced “mowsawll”). By local tradition Mousehole was the first place in Britain to hear the news of the great victory, news announced publicly for the first time in Britain from the town hall balcony of nearby Penzance town, at that time was a thriving community mostly of Cornish, Huguenots and a few Jews, trading to Northern Europe and the Mediterranean. To this day the loss of Nelson and Trafalgar are still commemorated in Mousehole and Penzance. Making slow progress in the light breeze Pickle hove to in Falmouth Bay, 10 days, 1,500 miles and an average speed of 6.5 knots from Trafalgar, having crossed the Bay of Biscay in conditions so stormy she sprang a serious leak obliging her men to jettison 6 of her carronades. Her commander Lapenotiere disembarked at Falmouth. Pickle in the charge of George Almy, the American-born second in command sailed her home to Plymouth. After some minor delays, we are not sure why, Lieutenant Lapenotiere took an express post chaise to London. Today it is possible to follow his route including visiting all the Ale houses were horses were changed. The route since 2005 is now marked on English Ordinance Survey maps as “The Trafalgar Way”. Arriving in London, Lieutenant Lapenotiere handed the dispatch to William Marsden, secretary of the Admiralty who at 02.00 woke Lord Barham, the First Sea Lord who had master mined the British strategy with “Sir we have won a great victory but we have lost Nelson”; then Marsden gave Lord Barham Collingwood’s now famous Trafalgar Dispatch. The prime minister William Pitt was informed at 03.00 and the king, George III at 07.00 after which the news was publicly announced. It is possible, even likely during the next 3 days while in London Lieutenant Lapenotiere met with Robert Dodds, a meeting that leads us to this Gordon Frickers painting.HMS Pickle “The Trafalgar Messenger”. Gordon lived in Cornwall for many years, worked with Cornishmen, he still sometimes sails with them upon Cornish waters. It is his conjecture that the legend is true and merits 2 new paintings. Pickle carried thesensational Trafalgar news, invasion averted, the combined fleet annihilated. Pickle’s original log (now in the Public Records Office at Kew) confirms coming in from the South West Pickle made an early morning landfall off The Lizard Point the most southerly point of the British Isles then she sailed on to Falmouth Bay, Cornwall arriving mid morning of the 4 th of November 1805 were her commander disembarked. Many of Pickle’s crew including her commander Lt. Lapenotiere were Cornish and Devon men although unusually, her first officer was an American. Pickle was a Devonport, Plymouth ship heading for home. She had regularly patrolled Cornish waters between 1802 and 1805 including fighting several sharp actions with French privateers. To this day people in West Cornwall, locally proudly claim the then sensational Trafalgar news, invasion averted, the combined fleet annihilated, Nelson killed, was first announced in England at Penzance, Cornwall. You can be confident that early on a November morning during wartime the fishermen would have been quick to spot and identify a strange sail emerging from the south west gloom of night thus Recognising Pickle. We know Pickle would have been well known to Cornish fishermen, to the men of Mounts Bay who most likely followed the shipping news so would have known Pickle was with Nelson. Even today many ‘real’ Cornish are a close knit sea orientated community. Among the ‘cousin Jack’s’ in the various vessels there may even have been relatives or brothers. *Knowing Pickle often carried dispatches it is likely the fishermen’s curiosity would have been aroused and the men of Pickle eager to speak with them? Given such historic news the fishermen immediately returned to port so the Cornish village of Mousehole (pronounced “mowsall”) was the first place in Britain to hear the news. Conclusion? Gordon Frickers thinks the balance of probabilities and having sailed those waters and lived with Cornishmen and out of respect and affection for the Cornish concluded the story is most likely true. Anyway the yarn is well worth two paintings which are now offered for £5,000 each. The name Pickle has been used 5 times by the British Royal Navy. The term cutter was used by sailormen in the same context that ‘clipper’ and ‘speed boat’ were later in the 19th and 20th centuries. A cutter required a brave, large & very experienced crew to handle her well and keep the mast onboard. Smartly handle cutters had many advantages including their ability to sil fast close to the wind. Miss handled cutters were frequently dismasted particularly down wind by rolling their boom into a sea; hence the rig eventually being considered unsuitable for ocean sailing. In short, cutters were fast but dangerous. Here is a clue for the reason for her conversion to schooner rig – of cutters, ‘The danger’ it was written, “when sailing large or when the wind is strong, especially when a heavy sea is causing the vessel to roll and yaw, the guy must be restrained forward by another tackle since otherwise an unexpected yaw might cause the boom to fly over suddenly, therefore violently, to the other side. The danger, coupled with the great weight of the boom and its projecting over the counter, and the fact that the whole of the sail area is extended out to one side of the vessel where the boom is at risk from striking the seas as the vessel rolls, all indicate that a fore and aft mainsail is less advantageous when sailing wind astern than when close hauled. Indeed, as a general rule, all fore and afters are greatly inferior to square sails on that point of sailing”. Gordon Frickers has a wealth of in formation on the evolution of the cutter rig including why the French Navy abandoned the rig. 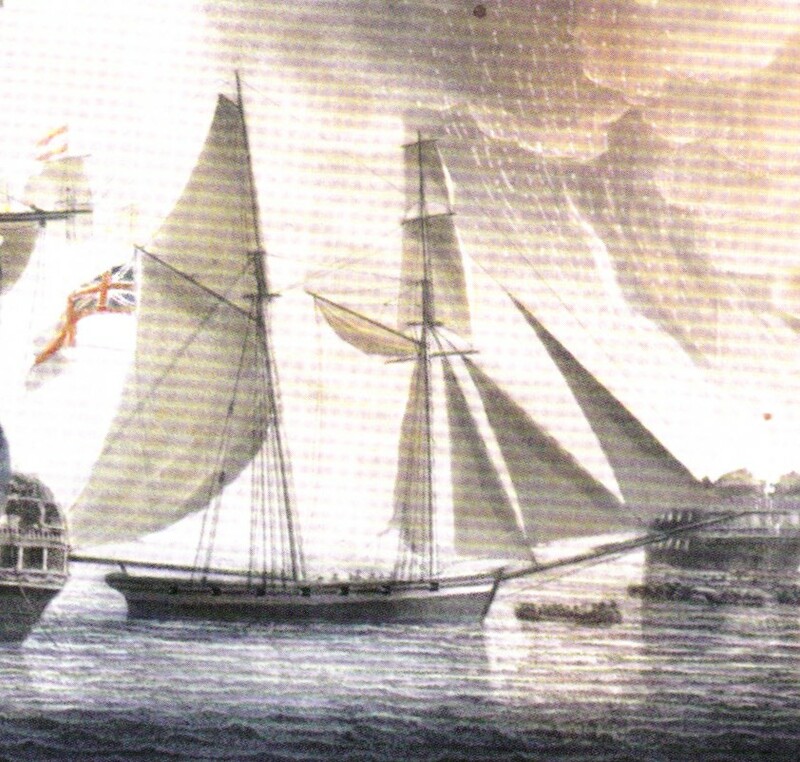 The French with a reputation for building fast ships, experimented extensively (gordon Frickers has copies of many of the records) to resolve the issue and about 1820 abandoned the use of the cutter rig for naval purposes, masts having consistently broken, even when the lower sections made for 74 gun ships were used. The cutter hull shape was evolved for speed, away from the full bow shape, good for carrying large loads & common since at least the days of Viking round ships Medieval Hogs, Cogs, Hulks, Hoys and their like towards the knife like bow that culminated in the clipper designs. Hence “cutter”, a ship which would in the language of the day “cut along nicely”. Pickle is documented as converted from a cutter to the more manageable and easier to sail rig of schooner by the Royal Navy at Devonport docks, Plymouth. The ‘Nelson’s yellow strake. Our exact colour results from recent research by Peter Goodwin and Gordon Frickers. Peter who has a talent for discovering lost documents found a letter from Nelson specifying the exact paint mix for the famous ‘Nelson’s bright yellow’ which Nelson preferred saying it looked more “war like”.. As a result Gordon carried out a series colour of tests, see his abstract paintings “Nelson’s Bright Yellow”and “Nelson at Gibraltar” has been the first full scale painting to benefit. Peter Goodwin’s knack for discovering lost documents extended to some relating to Pickle’s refits at Plymouth which mention her gunwale was curved as shown over the gun ports (a detail not shown on the Dodd picture). This feature was shared with some other small ships of the period. Thus this we hope you can agree is the most faithful rending of HM Schooner Pickle since the days of lieutenant later promoted to Captain Lt. Lapenotiere. The fishing boats in this painting are all Cornish luggers typical of 1805, the ancestor of the luggers still sailing today. 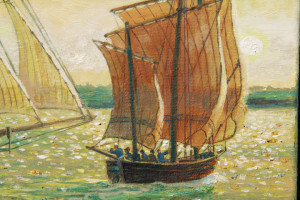 The Cornish luggers in the painting all show the 1805 design characteristics. In 1805 luggers generally set 3 masts as opposed to 2 masts post 1840 ish. Many French luggers ‘Chasse Marie’ (sea hunters) still set 3 masts with topsails as in the early 19th century style. Most Cornish luggers were around 35 feet length so about 40 feet length on deck. The luggers of 1805 were generally 30’ to 60′ (10 t0 20 m) measured as was then the custom between verticals, length over all was a little more plus bowsprit and bumkins. Some were smaller some as large as 90 feet on deck. Luggers were clinker (lapstrake) or carvel built. 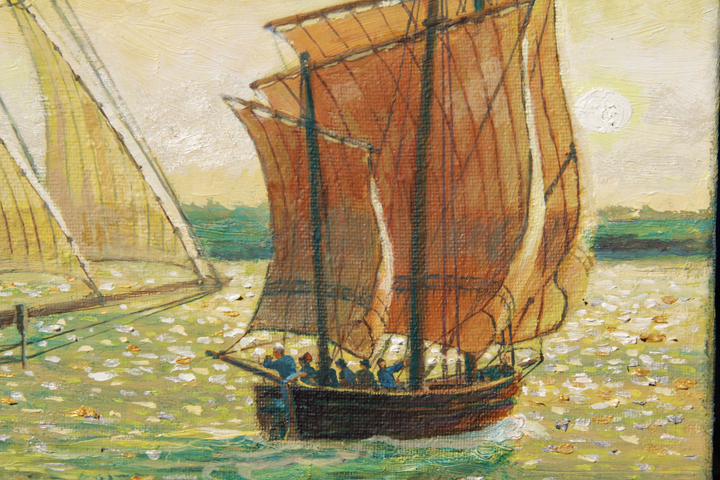 The rig was simple, economic and as modern luggers demonstrate, they sail well compared to today’s yachts. In 1805 they were worked by a crew of at least 6 they worked in teams of 3 boats. Lugger design changed significantly around 1840 with the arrival of the Great Western Railway at Penzance. The GWR gave the Cornish fisher folk access to a new larger market thus incentive to land their catches more quickly. Gordon Frickers also found a photo of a 3 mast lugger on Beer beach confirming many details he drew when he painted ‘plien aire’ back in 1974 the Cornish lugger ‘Barnabus’ at Falmouth. “As you know there has, and always will be, controversy between Penzance and Falmouth over the “Trafalgar dispatch”; but it is a well known fact that Pickle passed by Mounts Bay and there are artifacts present in Madron Church and the Union Hotel in Chapel Street Penzance that indicate that a fishing vessel communicated the news first from Pickle to Penzance. The luggers of West Cornwall changed their rig around the 1840’s from three to two masts. This new yacht style offered more speed to meet the introduction of the railways in 1853. 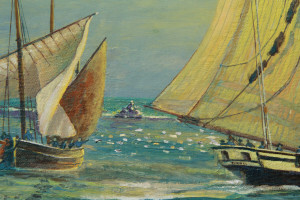 The best surviving example of the three masted luggers is a model of Emily on display in the County Museum at Truro; this is illustrated on page 65 of A. S, Oliver’s book “Boats and Boatbuilding in West Cornwall”. The rigging is also shown on page 17 and of Boy Willie on page 34. If you can’t locate this little book please let me know. Another invaluable source is Edgar March’s book “Sailing Drifters”, but I think the former has all the information you require. 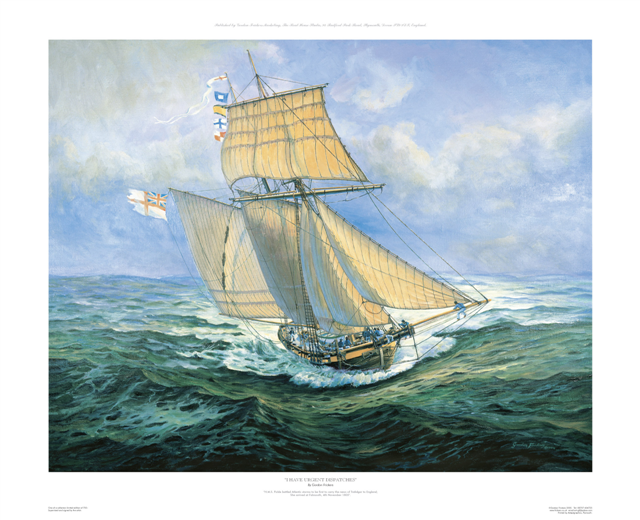 The Trafalgar Messenger, HMS Pickle, is available from £147.00 as a signed numbered heritage marine print from www.frickers.co.uk print gallery. 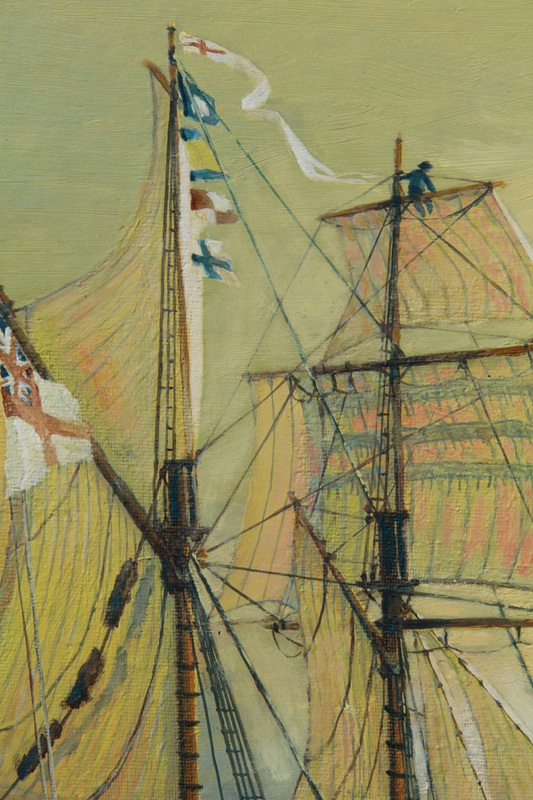 The splendid original painting The Trafalgar Messenger, HMS Pickle is available for £5,000. Payments can be made via Paypal, bank to bank and in easy instalments. Commenting on Gordon Frickers ‘Pickle’ painting Peter Goodwin, I. Eng AMIMarE. Historical Consultant, keeper of HMS Victory, H.M. Naval Base, Portsmouth said, “It’s the one thing that opened me up to the world of painting”. The 4 th of November is celebrated in the Royal Navy and elsewhere including the New York Yacht Club as “Pickle Night”. At the NYYC the American Friends of the Royal Naval Museum hosts the event, with support from the 1805 Club, the Nelson Society, and the National Maritime Historical Society. How Pickle Night was conceived is a beautiful story in its self. A. S, Oliver’s book “Boats and Boatbuilding in West Cornwall” & Edgar March’s book “Sailing Drifters”. Tony Pawlyn a trustee of the National Maritime Museum Cornwall at Falmouth and Professor Jan Pentreath have a fine collections of photographs of Cornish luggers. Gordon Frickers has produced a series of talks on Nelson and given 10 acclaimed 2 hour interactive talks on Nelson as a role model at the Swarthmore Centre, Plymouth. H.M.S. Victory and the battle of Trafalgar, are they important? H.M.S. Victory is the only surviving ship of her type from a time when all major European countries had fleets of such ships. Trafalgar was a battle that effected / changed world history for over 100 years. This fine marine painting of “The Trafalgar Messenger”, the making of a Cornish legend, available as a Heritage Quality print, see Print Gallery and Payment Page, price from £147.00 including postage.